I’ve been asked if I’d post a copy of the poem that got chosen for the McLellan Prize. So I will. Now. A bunch of thank-you’s are in order. ‘Or I might just think of Bheinn na Caillich. because they built with stone and had mastery of iron’ No. I have no idea why. Second thing. Concentrated writing exercises will do nothing if they don’t somehow tap into ideas that you don’t consciously know you have. So thank you, Robert Macfarlane for writing The Old Ways which planted in my head and heart the idea of the sea as a highway on which we leave no marks. Third thing. Yet another thank-you to Ann and Peter Sansom who have taught me how to wring every last ounce out of a writing day. Finally. Thank you to every one responsible for the McLellan Arts Festival. Thank you to everyone I met for their generosity…especially, to David Underdown, Cicely Gill; to Chris Harrison (for the music); to Jonathan Totman (2nd prize winner) and Zetta Bear(Commended) for your readings. 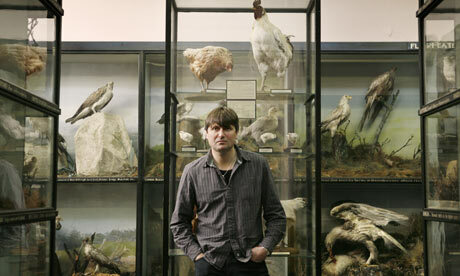 And thank you, Simon Armitage. A man of impeccable taste and discernment. because their oceans were swanspaths, whaleroads. bracelets, cloakpins, breastpins, clasps and rings. shrank in the wind on racks of spruce? and no one would touch it. Here’s a first…I’m writing this from the island of Arran; there’s a banner of cloud streaming from Goatfell. On this side of the island, the rocks that run into the sea are water-fluted sandstones; oxblood and ochre and tan. Unbelievably old. The granites of the high fell are youngsters. Half the places on the island were named by the Vikings. Everything’s layered. Robert Macfarlane’s lovely book, Landmarks, begins with this sentence. This is a book about the power of language -strong style, single words – to shape our sense of place. I suppose it’s not the place’s fault,’ I said. It’s as though he can’t locate his personal history in the history of place, as though it had no significance other than the awful paradox of making no impression. I imagine he’d have been disdainful, but I find that close to heartbreaking. Place isn’t just topography. It’s story. 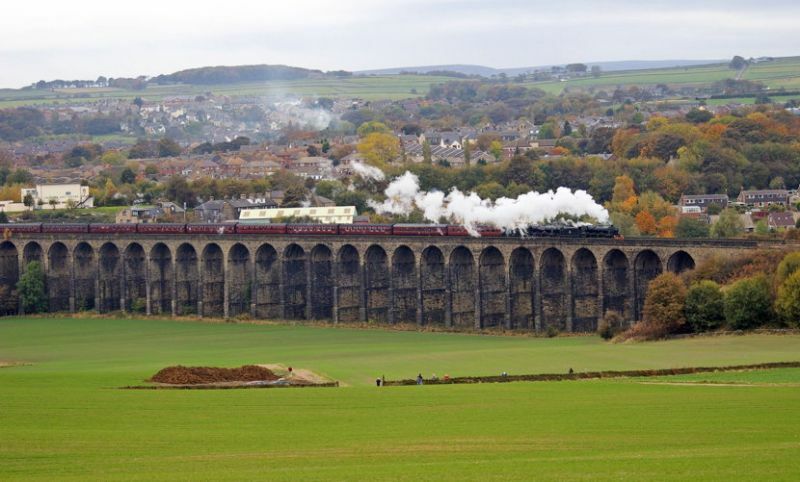 I grew up in a mill town in the West Riding (or, as my guest today might say, thrydding). There was a mill at the bottom of the street. Behind the mill, on the steep valley side, a railway line; beyond that, farm lands and old farm buildings. 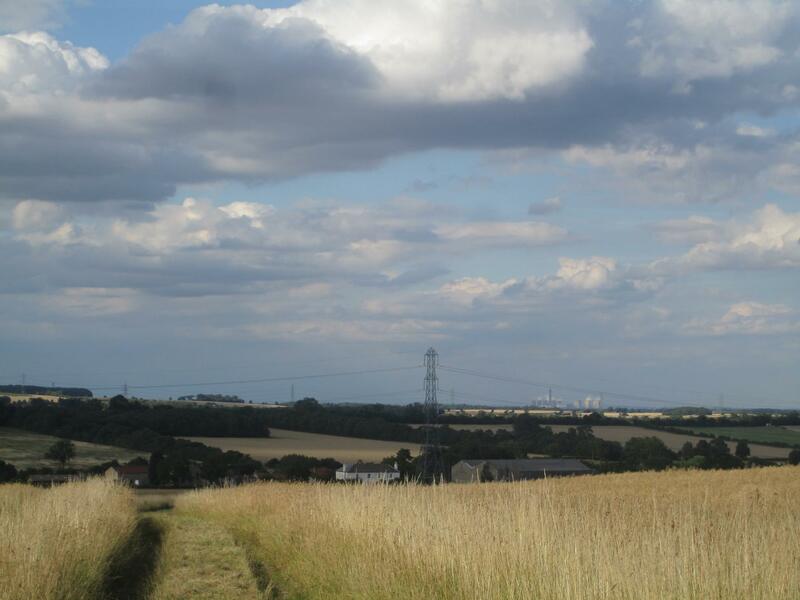 beyond them, open cast mining, brickworks, all interpenetrated by woodlands and small bits of farm land. At the top of our street was a ramshackle dairy farm, and beyond that, old pit workings, a prefab council estate, more farm land, small mills, a foundry. One of the dairy buildings was a barn that my art teacher found had been a chapel of the Knights of St John. It was hundreds of years old. Some time in the 60’s the farm was sold and it was all torn down. No one noticed. Basically, I grew up in layers of history that no one seemed to take much account of, in the industrial West Riding where fields and woods and 16th Century manors like Oakwell Hall were a short bike ride away. Most of the mills have been torn down, or converted to designer apartment units; the handsome 19thC chapels are carpet warehouses or have been demolished and replaced by shiny mosques. History round our way doesn’t come in neat layers, like it does in the first history book I saved up to buy when I was nine: Our Island Story, by H.E. Marshall, that splendid romanticised Whig account of why Brittania shall forever rule the waves. Real history is like those layers of geological strata that are buckled and riven by tectonic forces, scoured by glaciers and ice sheets and rivers and weather. It’s full of nonconfomities and erratics. It’s rich, confused, and often overlooked. It’s not the history I was taught at school. I think that’s why today’s guest, Steve Ely speaks so directly to me in his collections, Oswald’s Book of Hours and Englaland. He reminds me of the jolt I got when I first read E.P.Thompson’s The making of the English Working Class, and Hobbsbawm, and The common muse, and Roy Palmer’s The Rambling Soldier, of when I first listened to Charles’ Parker’s radio ballads…especially The ballad of John Axon ….. and Tony Parker’s Red Hill (the story of a mining community). He reminds me of a scion of the MacDonald’s at Dunvegan Castle. I asked him what the date was so I could write a cheque to pay to go into ‘his’ castle. ‘Trafalgar Day.’ he said. But what’s the date, I asked. ‘Don’t you know your history?’ he said. I can’t describe the condecension. Esprit d’escalier had me laying him low with a line about knowing MY history, and that it wasn’t the same as his. Because, yes, I do. Englaland isn’t edgeland. It’s right in the middle of England, the landscapes of farms and pit villages and power stations and their great white plumes of condensation, despoiled monasteries, forgotten castles, the remains of priories – like the gateposts in Steve Ely’s photograph here. It’s the landscape that D.H.Lawrence wrote about, and his loathing of the man-made England. Because pit villages are never pretty or picturesque in the way of, say, Pennine mill towns. 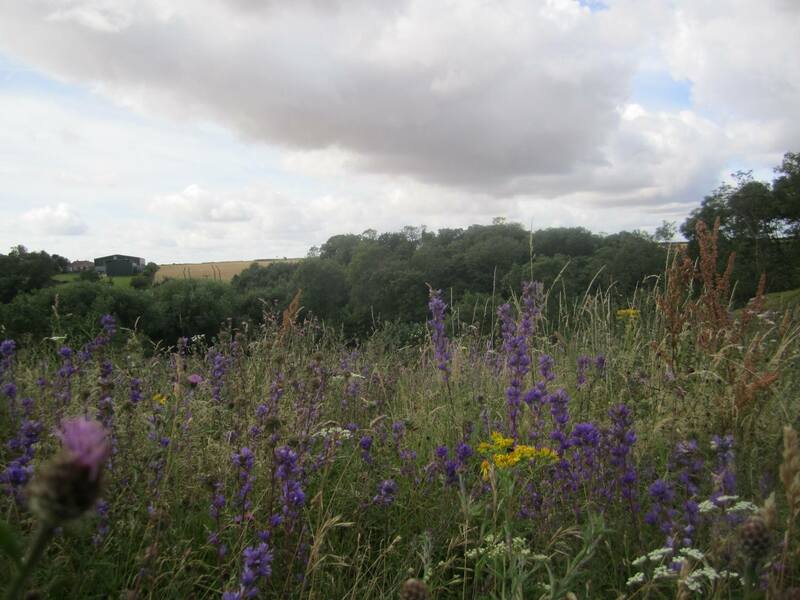 But they are surrounded and interpenetrated by an older farmed and forested England. Which is Steve Ely’s ground. I first met him about a year ago; the circumstances were inauspicious. I drove with the poet, Kim Moore to a Saturday morning reading. On the way someone pulled out directly in front of me and smashed up the front of my car. It was still driveable, just, so we got there. It was not a well-run affair. Open mic.ers got more time than the four guests. A lot more time. Kim read in the time she was allowed, and then our day was saved by Steve Ely. 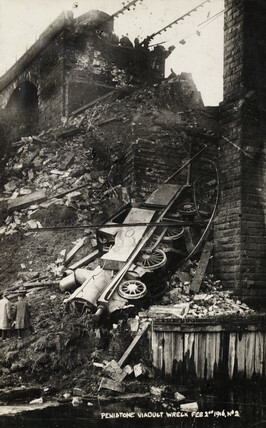 He read one poem about the demolition of the headstocks and winding gear of a pit village near Hemsworth. A sin and a shame. That’s the five word, utterly eloquent, eulogy of the poet’s mate, Craig Emerson who, like thousands of others, spent his working life there. It’s an electrifying poem. It makes the hair stand up on the nape of your neck. And so do the others, full of elided, compacted histories where you’re hardly surprised to find Arthur Scargill engaged in dialogue with the Duke of Wellington, and where the Battle of Orgreave is no more contemporary than the battle of Brunaburh, and where the language of Langland is alive and literally kicking. He doesn’t say much about his passion for medieval history, secular and ecclesiastic, for the driven alliterative rhetoric of medieval poetry, or indeed, for whippets, but he doesn’t need to. His poems do that. And there are a lot of them. It’s next to impossible to choose from this rich wordhoard. So I’m glad he’s chosen for me….and even then I’ve had to be highly selective. He writes, very often, in big chunks that have to be read aloud, if not declaimed. Often they’re not comfortable, and sometimes they are downright exhausting. I love them. The three extracts he’s sent me let me illustrate everything that speaks to me in his poetry. The first one speaks for that landscape I wrote about at the beginning…and that he’s passionate about. Blanketing snow has smothered the night in hush. forest and hand-ploughs opened the sod. I’ve tried very hard to battle wordpress reluctance to reproduce this poem as Steve intends it to look, with a hanging indent of the first line of each ‘verset’ (think of Geoffrey Hill’s Mercian Hymns) , and the prose-poem stanzas left and right justified. I can’t get the symmetry of what he sent me BUT it clearly knows what it’s up to and it’s as close as I can get. It demands to be read aloud and attended to, with its echoes of Robert Frost, of Gerard Manley Hopkins, of Lawrence and Langland’s ‘Piers Plowman’, its relish for archaic words- oxgangs and hagues- , the simulaneity of history in a single moment of time in a single place. The language I love for itself, as I do in this next poem. Johan the Mullere hath ygrounde smal, smal, smal. The Kynges sone of hevene schal pay for al. There were no lords in Eden’s commune. Scythes sharpened on whetstones, gente non sancta. War will follow the Word. The four lines beginning : Johan the Mullere are by John Ball himself. It’s good, though not comfortable, to be reminded that men and women were mutilated and burned in the cause of a vernacular Bible, and that if you want to rule a people you take away their language, and that the tongueless man gets his land took. This is the history, and the passion for it, that the the young aristocrat of Dunvegan would never understand. It has to be fought for. There’s a lot of fighting in Steve Ely’s poetry. And scrapping, and brawling. He’s sent me a third poem that’s long enough to be published like a serial. Big Billy, the brawny bugger tamps down the turf on the grave of his dog, and his eulogy is as terse and packed as Craig Emerson’s for the demolished pit:‘he were a bloody good dog’; and then he’s off for the challenge of the fairground ‘Mighty Thor’, and a bareknuckle battle for afters. pro-pugilist, pummeller, fair-field punch-out king? standing still after three sledgehammering rounds. I’ll back my brawl against this ballyhooed bum. the brute that bested Bombardier Billy. never to land the Lonsdale Belt. with a jolting jab to the jaw. a globe-gutted grey-beard, a geezer gone to seed. It’s an epic fight where you’re battered with the sheer weight of alliteration. Billy prevails. a swanker, swelled with self-regard; so what? on the cleft of his crag-hard chin. slumped and starfished-flat, spark-out on the boards. and dragged the demented destroyer away. in broken hands, bruised and bloated to blackening stubs. each poured pint dulling the pain. I’ll finish with an excerpt from an interview he gave with Sheena Pugh. You can find the whole piece on her poetry writing website. SHEENAGH: You’re very unafraid of words. That sounds an odd thing to say of a poet, but I’ve read so many reviewers, in particular, who seem downright terrified of any vocabulary vaguely out of the ordinary. Use an esoteric or archaic word and they’ll complain of elitism; use modern slang and it’s condemned as unsuitable or a “duff note”, as if modern argot and poetry were somehow incompatible. One of the things I like best about your work is how you cheerfully expect your readers to cope with liturgical language, Latin, Anglo-Saxon, umpteen bird and plant names, lovely obscure words like xanthic for yellow, and you mix that in with army slang, business jargon, politician’s soundbites…. STEVE: Words are my business, and as such, every word, in every language — past, present and future — belongs to me. I’ll use them as I see fit. Relatively early in my poetic second-coming I was expressly warned-off from using the word ‘cerulean’ by a well-meaning would-be mentor. My response was to write a poem (‘fancy THAT’, from my unpublished book, the compleat eater) that deliberately and provocatively deployed the word. Since I began to write again in 2003, I’ve used a range of registers, vocabularies and languages — Yorkshire dialect, the cant of U.S. prison gangs, Calo (the Hispanic ‘creole’ of East Los Angeles) , and many more, including the examples you cite. In ‘The Song of the Yellowhammer’ (Englaland) I also use two Romani words, ‘sunakai’ and ‘salno’, which both connote ‘yellow’. In the stanza of the same poem in which I use the word ‘xanthic’ there are five other evocations of ‘yellow’. I’m trying to make it golden. You’ll not often feel comfortable, reading Steve Ely’s poetry, and you have to do the work of reading it aloud, because its roots lie in the poetry that predate literacy. But you’ll be rewarded, no question. Thank you for being my guest, Steve and for sharing the passion. And the landscapes. And the history. Next week we’ll be looking at lists. They’re more interesting than they sound. In the meantime you could be reading Steve Ely’s ……..
As a matter of fact, I couldn’t resist this image of a Pennine poet among the display cases of the Tolson Museum in Huddersfield. The reason should become clear as we go along, but I warn you in advance that this is the third post I’ve written in the last two days (the other two for other cobweb spinners and weavers who’ve asked me to guest on their sites; I’m not sure when they’ll be posted, but I couldn’t be happier to be asked. )….however, all three involve a bit of reflection on the writing process as I know it, and the thing is, I fear they may start to bleed into each other, or run like watercolours, and I’ll lose the thread. Fingers crossed. I’ve just noticed I’ve managed to stack three metaphors into three consecutive clauses in one sentence. Sorry about that. I’ve been thinking about that question that writers of all kinds get asked: ‘Where do you get your ideas from?’ I’m not thinking of the business of what prompts you to recover them from the dusty, badly-curated bits of your memory and unconscious. That’s what writing workshops do for me. No, I’m thinking of the question of where it all comes from in the first place. What if you’ve had a pretty uneventful life? What if you’re not widely travelled. And why do we improvise on these first hand memories and on vicarious experience? James Britton memorably said it was because we never cease to long for more lives than we can actually live. So we read, we read, we watch films and television, we go to art galleries, we wander around cities, we walk through landscapes. We might even go into museums. I’m reminded that when I was doing a lacklustre MA in a lacklustre way for lacklustre reasons I had to write an essay about the ‘Writer as researcher’ and to reflect on the nature of the research I undertook in order to write poems. Where do I get my poems from? What are they about? The more I look back, the more I see how one idea or notion will lead to another in ways that take me by surprise, and I accidentally stumble on information and images that find their way into poems….or become poems. And to be fair, how some of the books I read bleed into my writing. Here’s a confession. Every now and then I realise that I’ve hijacked another writer’s turn of phrase, or even come close to incorporating whole phrases and clauses into my writing. Not consciously. It’s as though they’ve morphed into ‘my’ thinking. John Prebble is one such. Wanting to make sense of crofters and Clearances inevitably took me to Prebble, and I find I’ve lifted a phrase about ghosts from ‘Glencoe’ that turns up, not much changed, in a poem called Boreraig, and another called A kind of history. And these are the ones I know about. It’s an odd thing, this ‘research’. I’ve stumbled on stuff in Prebble, say, about Portugeses mercenaries fighting an awful rearguard on the slopes of Glen Shiel…why does it bother me? Why do I want to write about it, re-imagine it? Reading about the painter, John Waterhouse took me down sideroads of myth and legend, to Ovid, and then to Ted Hughes, and by another road to statues and sculptures, and thence to Queen Victoria’s journals, and the building of Nelson’s Column, and thence to his ships and his battles and his wounds. Vikings, the Spanish Civil War, crucifixion (did you know the sloping wooden ‘step’ on a cross is a suppadaneum? ), Albert Pierrepoint, railway navvies, Mayhew’s street people………of late it’s been the history of maps, and, especially, Robert Macfarlane who has taken me back to the Vikings, to Everest, the geology of the Cairngorm. And people ask: where do you get your ideas from? As though that was problematic. The problem for me is knowing when to stop, to concentrate. While I was rereading her Poetry Business Pamphlet Competition winner Breathing through our bones (chosen by Carol Ann Duffy! Yes, it’s that good.) I realised what it was I liked so much about Julie’s writing…it’s that every poem is a surprise, that each one is unexpectedly different from the last, and at the same time the voice is reliably the same. And the other realisation is that there’s not a shred of ego, or self-consciousness. Just a genuinely curious delight in the unaccountable richness and diversity of things. But I’m forgetting my manners. If you’ve not met Julie Mellor before, then let me introduce you. Julie was born in Penistone, (which, as you’ll notice, has a viaduct…always a commendable thing, and is also one of these towns where everyone is someone’s cousin twice removed) where she lives with her partner and her most treasured possession: her dog. After doing various jobs, including working in a shoe shop on London’s Oxford Street, and as an au pair in Sicily, she gained a degree in English at the University of Huddersfield. She went on to do an MA in Writing at Sheffield Hallam, followed by a PhD, which she completed in 2003. Her poems have appeared in magazines and anthologies including Ambit, Mslexia, The North and The Rialto. Breathing Through Our Bones was published in 2012, ‘Poems with a real ability to own their subject – whether spontaneous combustion or the collective thought of geese – and which remain to intrigue long after reading’ – says Carol Ann Duffy. I’m not about to argue with that. I’ve known her for a few years as a regular at the Poetry Business writing days, which is where I’ve seen many of the poems in her pamphlet appear for their first airing in public. And thing is, they ‘stick’. They’re always memorable. Not just the subjects, but the turn of phrase, the exactness of images. Here’s a few examples, just so you tune in. You’ll encounter The roots of lycopsid trees , the Bishop of Tours, St Martin who chose to live with geese, Joseph Prigg, aged thirteen, who died of injuries at work, four days before Christmas, 1869. Because here’s a poet who spends time (like Simon Armitage) in the Tolson Museum in Huddersfield, who is interested in churchyards and gravestones, and brings the dead to life and breathes through their bones. Anyone can be quirky and eccentric with their choice of subjects. Making them connect with our lives is another thing altogether, and that’s what her poetry does for me. It grabs my attention, too, with images that are surprising and true. I truly hate canal towpath walking, and this is why. we are propelled through, side by side. white as a maggot or a baby’s first tooth. Clusters of sorcery, we store the sun. The juice of us is a blue flame. Even the wary fall for our frumenty smell. that marks you for hanging. the cushions, all that wadding. I felt the tube explode inside me. at the end of my varicosed legs. the best part of a week. unwinding her ball of string. in an empty room, without my hat. Gaia Holmes, another poet I like a lot, will do this kind of thing. A sort of surrealism that works because it stays deadpan, even as it piles the improbable on the implausible, and then turns round on itself in the ambiguities of a room full of grey light, and something that’s wistful, and bleak and comic, all at once. Lovely. Now, just one more. This one has been published in Ambit 219. I think it’s one of the few of Julie Mellor’s poems that are explicitly personal. are animate and fondling in their movement. but those unwanted spaces where words land and rest. under layers of paint so the glass rattles loose in the frame. raw as lambs’ liver, leaking on a white plate. all this quiet air around it. What grabs me is that line..what I’m really saying is, here is my heart. It’s simple, or it seems simple.But it isn’t at all. And you can’t ignore it, plain and unadorned amongst all the analogies that dramatise that business of trying to find the right words when the plain words were the right ones after all. So there you are. the pawning of ulsters –? what, for centuries, has been lying at our feet. I hope that’s right. In any case, Google her. We’re having another guest next week. As a matter of fact, another Yorkshire poet, and a man who knows the finer points of a whippet. Don’t be late. And remember: More haste, less speed. Roy Marshall has asked me to be his guest on his splendid poetry blog. A pleasure and a privilege. I thought it was probably best if I postponed ‘the great fogginzo’s cobweb’ till next week. But that lets me announce that my guest and polished gem will be Julie Mellor, winner, a couple of years ago, of the Poetry Business Pamphlet Competition. Not just polished then….gleaming and brilliant. Don’t miss it. I’ll be taking a register, and notes will not be accepted. It is a fantastic poem, the best I’d read for some time, and I wondered why I hadn’t seen anything else by this writer and why this poem wasn’t in that year’s Forward collection. A few years later and John’s work is unsurprisingly featured in the Forward Book of Poetry. John has kindly agreed to showcase a few poems here, and in response to my request for him to talk about his writing we have the added bonus of his wonderful ‘stocktake’ . I am deeply honoured that he has chosen to let me publish his previously unpublished poem ‘A weak force’. I have just finished laying out the poems and paragraphs for this post, and my face is still wet with tears, my breath still taken away. This devastating and beautiful poem shows how John’s work has evolved and changed, enabling him to go deeper and further than most writers ever could. I first met John (or rather observed his immaculately waist-coated bright-eyed and tanned personage) at a Poetry Business writing day in Sheffield five or six years ago. During a read around of work written that morning he fluidly piled words upon words to describe the interior of a shed or garage or attic. I hope John will forgive me for not remembering the exact location he described, nor the name of the poem in question. I do know that I didn’t want the poem to end. It was evident that John knew his materials (both the language he wanted to use and the physical objects such as rope and tacks and tools) so well, and handled them with such precision that the list of objects sang and gathered in layers to build a sense of place, and, more miraculously, a sense of the person who had collected them. This description doesn’t really do justice to John’s skill, so I hope you will gain some idea of how his poems build from the poems that follow. On another occasion I was to benefit from his support and encouragement as he commented, after I’d read my own draft, that we were ‘in Heaney territory here’. This was the first time I’d ever had a poem compared to another poet’s work, and as far as I was concerned, Heaney was a pretty good place to start. John is now well known for his ‘cobweb’ (he dislikes, as we all do I suspect, the word ‘blog’) a space he utilises to generously air his thoughts and to champion poets whose work he feels we should know about. a soulful, cerebral collection which you can purchase here. Ladies and gentlemen, John Foggin. Basically, all my poems were like the photograph of the shore at Achnacloich. Empty of people. Which leads me to a shift, of sorts. 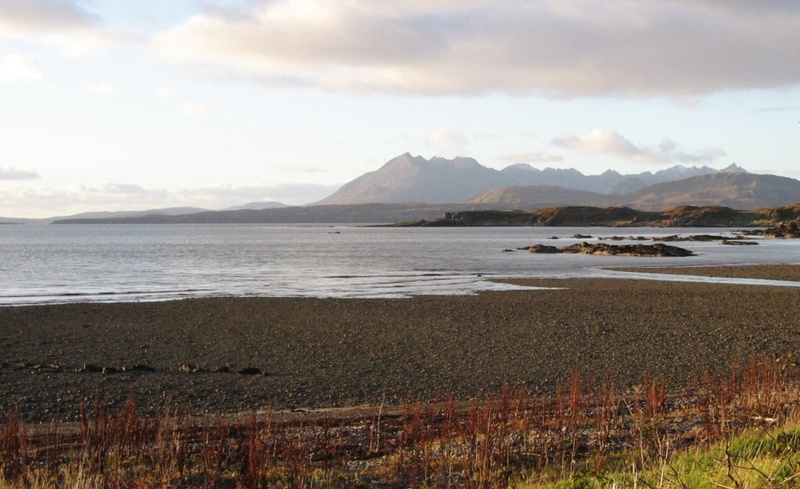 Back then, even before I started on an MA, I went up to Skye for a week on my own TO WRITE. I would write about Clearance sites. I would read John Prebble. I would take poets with me. I would be serious about it. Not much came of it except this one poem that eventually was accepted by ‘The North’. I didn’t know that was a big deal. I know better now. The backstory is that I was getting myself lost as usual up on the moor, following, and losing, deer tracks, and looking out towards Rhum, and back to the Cuillin, and realising that I couldn’t see any of it straight. It was all coming through the lens of Ted Hughes and his stags, and his stones and his horizons. And it was that frustration that I wrote about. I wouldn’t have thought anything of it, but when I came home to radio and newspapers, I discovered that had been the day that Ted Hughes had died, and I thought that made the poem worth keeping. Here it is. shiny at cuff and collar, creased at knee,at elbow. open as the sky; falling for ever. in those gulleys gouged in the cold hills. fans and blades of honey, silver-gilt. a scattering foil of birch and bloodbead ash. for the performance of heaven. all fixed in the reflex of your hawk’s eye. were under my feet. That day. I realise now it more than just a bit of landscape painting, and that I was enjoying collaging lines of Hughes’ poems into my own, and I was actually writing about something personal. But I didn’t stay with it. It was another 5 years before I started again, and I made a big effort to populate my poetry. I took my cue from The world’s wife and worked away at ventriloqual monologues spoken by fallen angels. I like some of them, but no-one else seems to. I wrote about John Waterhouse, the painter, and his wife, and his favourite model. More dramatic monologues that didn’t go anywhere very much. And then a long hiatus, though I started going regularly to The Poetry Business Writing Days, and they slowly worked their magic. Tentatively, I started to write about real people, but very self-consciously and awkwardly until 2013 when I was on a writing residential and I wrote this poem that changed everything. that I made for you before I knew you weren’t alive. not knowing you’d been applauding from the Underworld. who will not believe that you’re not with us any more. and shoals of cod, and all the grey North sea. Years of reading and teaching, and having a family and a history were stacked up, waiting to be dealt with and voiced. It took 70 years, but I finally got going. More fallen angels, poems for my parents and for my grandparents, and my children, and long-ago girlfriends, and finally, folktale and myth that became imaginatively real and relevant for the first time in my life. Daedalus let me write about the death of my son. Ovid’s Metamorphoses and Garfield and Blishen’s The god beneath the sea reminded me why I loved Prometheus and Hephaestus, and why I loathed most of the Greek Pantheon. Norman MacCaig taught me it was possible to write about gods and heroes with the ease of familiarity. Which is what lies behind this poem that I chose to put into my chapbook Larach (along with John Keats’ urn and Orpheus and the rest). It’s nice to feel comfortable enough to be angry in a poem. A bit of blood and bruising. for Olympus and its thuggish brood. the loud incontinent reek of death. let bits of heaven shine through. I suspect all my pent-up frustrations about arrogant Old Etonians and their sense of entitlement, and their palpable contempt for the rest of us has fed into this. Whether it’s healthy or not, I don’t know. But I enjoyed writing it. I like doing it at open mic. events, too. The last year has brought new breakthroughs that I’ve recognised in the moments where they happened. I’ve reached a point where I can write with what feels like real emotional/imaginative truth about the things that matter to me more than anything. It’s a long business, learning not to shy away from hard truths. Kim Moore has taught me that in her poems that deal with domestic violence in her lovely collection, The art of falling. And then, in March this year, in a residential she ran, she somehow ambushed me into writing a poem about my son’s suicide, direct, unmediated through games with myth and personae. It’s the poem I’ve waited all my life to write. from the top of a tower block. They say gravity is a weak force. of salt sea from its shore. and you were far beyond falling. I remember how you ran like a dream. and sank like the sun. Thanks for inviting me, Roy Marshall. It’s been good to take stock. Sometimes you’re running an open mic. (say, at the world-famous Puzzle Hall Poets Live) and someone does a poem that makes you say: can I have a copy of that? And if you spin cobwebs you can say: oh, and can I put this out on the aether? And if the someone’s a librarian called Simon Z. (like Joseph K..but not fictional), he thinks a for a bit, and then says: Why not? So, for everyone who cares for education and literacy (….which is all of you…).and who has ever been inspected or had their interpersonal team-building communicative skills profiles honed by a training day,(which is probably all of you) this is for you, from Simon Z. First, don’t mention the books. Today’s libraries have absolutely nothing whatsoever to do with books. say they’re awaiting pick-up by waste disposal. even though it takes up the space where a bookstand used to be. Actually, best not mention the bookstand. Or the books. Don’t mention the books. which, to be fair, takes a real effort for those whose work does not involve serving customers. but maybe don’t mention that part. Or the books. Don’t mention the books. Praise the computers. Celebrate the Community Engagement Framework Model. implement them, and pretend they thought of them. and wear confidence clothes, while charging more for presenting a one-day course than the annual budget for books. But then, I must warn you, don’t mention the books. Ever. This is the modern age. We have Kindles now. Or some of us do. The ones who take the trouble to keep up. We must be bold and forward looking. We must relish challenge and embrace change. Just agree to everything. Question nothing. Keep your head down and don’t ask awkward questions. Look serious when they do, laugh when they tell jokes, explain how you feel it is important to address 21st Century issues with 21st Century solutions. And for God’s sake whatever you do, listen – just don’t mention the books. I mentioned them once, but I think I got away with it. 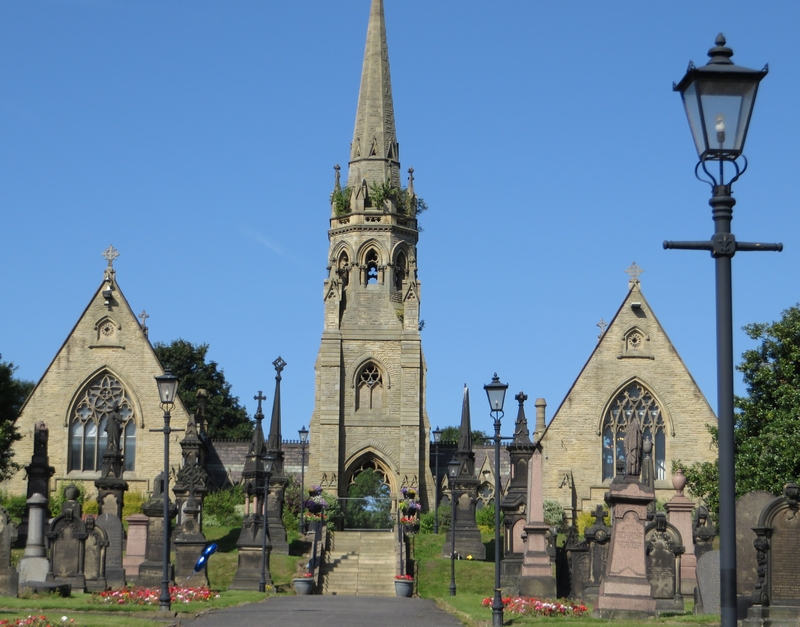 Batley Cemetery. Archetypal northern cemetery; it might have been the model for the scenes of courtship and cack-handed attempts at seduction in ‘Billy Liar’ where Tom Courtenay tries to distract Barbara from her orange segments. 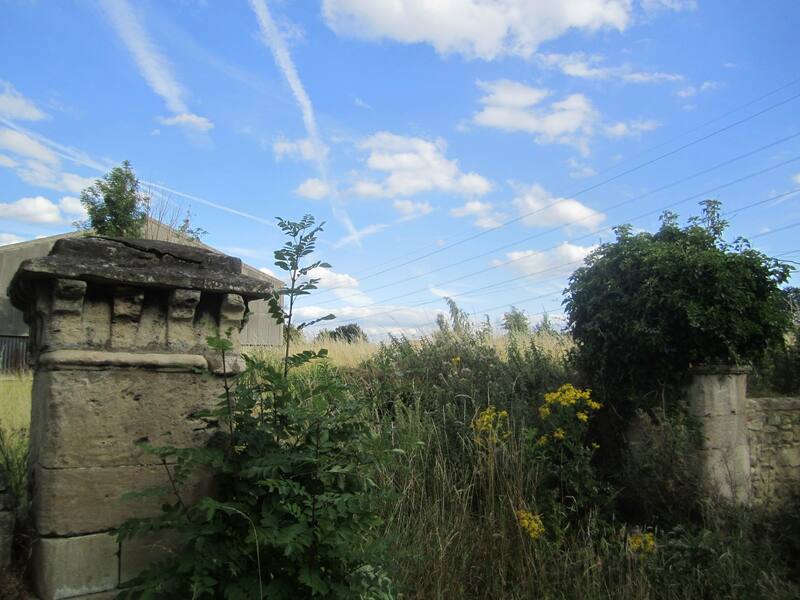 I’ve not been since I was a teenager, when it was already looking neglected and overgrown, and the twin chapels had been shut up and declared unsafe. I was back there yesterday thanks to the work of a team of volunteers who’ve restored the West Chapel and made it beautiful, and to the volunteers who have tended and restored the graves of men who died in World War One, and who mark the 100th anniversary of the death of each one. Yesterday was the 100th anniversary of the death of my grandfather, Alfred Terry, and yesterday, thanks to these remarkable people I laid a poppy wreath on the grave that he shares with my grandma, Ethel. The sky was astonishingly blue, and there was an honour guard of a single soldier in full pack and WW1 uniform with sergeant’s stripes; it was moving and lovely. They always told me I took after my Dad. But I look at pictures of 30 year-old me, and it’s Alfred I see looking back. He’s ridiculously young looking. And on the basis of this flimsiest of evidence I wrote poems about him. But on an army bed in Aldershot. the despair of the RSM. The joker in the trench. Except, I’ve no way of knowing if he ever was. O dass ich tausand zungen haite. Armageddon. a small girl, left all alone to scrat and fend. they hissed like the sea on a shingly shore. that ran blue and plum and crimson red. and the pink of balsam, sour as a sink. I notice I was just a bit circumspect with the story. ‘I think’…I’ve left myself a get-out of sorts. I’m confident about that ‘unsoldierly’, though, because I’ve got him pegged as a reluctant volunteer. But this is what a volunteer researcher tells me about my granddad. Alfred Terry was born in 1882 in Batley to Samuel Terry and Hannah Wood. The 1911 Census shows Alfred and Ethel, together with their five year old daughter, Nellie, living in 3 rooms at 60 Bradford Road West, Carlinghow, Batley. Alfred’s occupation is given as a House Painter. Three more children were born to the family, Marjorie (my mum) (1911), Norman (1913) and Hilda (1915). Before the war Alfred had served his painting and decorating apprenticeship with John Tomlinson of Upper Commercial Street, Batley. 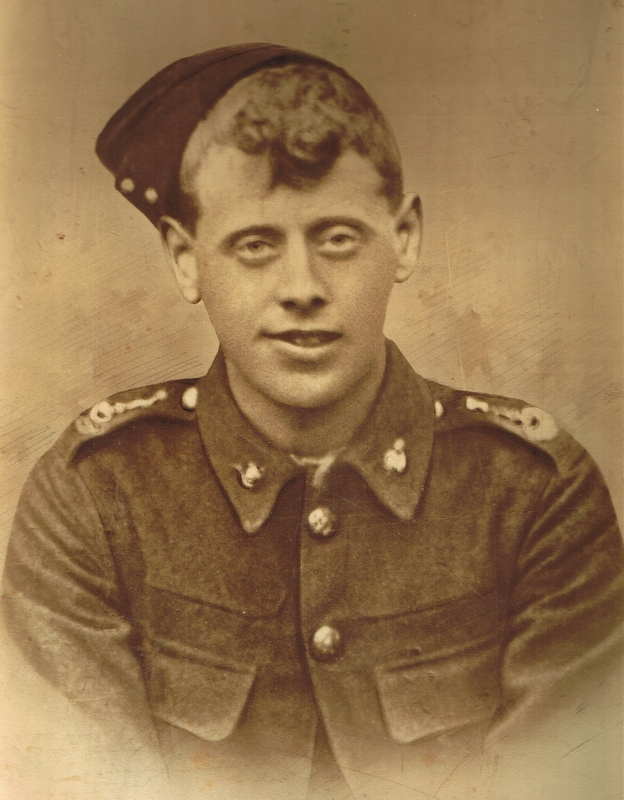 He had joined the Batley Volunteers and Territorials in 1901 and had been promoted to Sergeant before WW1 broke out. He was entitled to a long service medal by 1914 but the war had interfered with the receipt of the medal. When his camp at Whitby was broken up Alfred accompanied the Territorials to Doncaster, Gainsborough and York. His comrades went to the Front without him and he returned home to Batley. After a short stay at home he was sent to Beckett’s Park Hospital, Leeds as he was suffering from Bright’s Disease (a chronic inflammation of the blood vessels in the kidneys) resulting in protein in the urine. He was never to return home and died in hospital on Sunday the 8th of August 1915. On the day of his funeral a short service was held at his home. His coffin of polished oak (provided by Messrs. Will Akeroyd and Sons, Ward’s Hill, Batley) was draped with the Union Jack and his cap and belt were placed upon it. Afterwards, family and friends together with military personnel attended his funeral at Batley Cemetery. Edith was surrounded by many family members including her two little girls, Nellie and Marjorie. Alfred was held in high regard by many and there were numerous floral tributes. Six sergeants of the 2nd/4th K.O.Y.L.I. acted as Bearers. The service was conducted in the cemetery chapel and the choir sang “Jesu, Lover of my Soul” and “Lead, Kindly Light”. Colonel Hind had given permission for a firing party of the 3rd/4th K.O.Y.L.I. under the command of Sergeant Ainsworth. They fired three volleys over the grave and two buglers from the 3rd/4th K.O.Y.L.I. sounded The Last Post. Alfred’s widow Ethel continued to live in the Carlinghow area and bring up her children. She never re-married and died in 1937 aged 55 years. Alfred’s name appears on St John’s Church, Carlinghow, War Memorial. What can I say now about that ‘grinning and unsoldierly / the despair of the RSM’?. This is Sergeant Alfred Terry, who’s entitled to a long-service medal. Who died of Bright’s disease, in Leeds, and not pneumonia in Aldershot. That’s not all. I relied on my mother for stories of her family and her growing up…and indeed, of my Dad’s family, because he never told any. For years and years I believed that my grandma Ethel drowned herself, and that my mother was a teenager when she was left homeless. What’s more, my daughter Julie tells me that that’s the story she believes, and she believes her gran told her so. But I stood by a grave yesterday that said quite unequivocally that Ethel died in 1937. My Mum was 26 then; hardly a teenager. It’s carved on the headstone. And nowhere anywhere can I find a death certificate; I’m not sure I want to. But what do I do about these poems that I wrote because I believed them to be true? Before I published my pamphlet Backtracks last year I’d had the information from the Batley History group, and I just had time to change the poem ‘Thole’, and omit the line about my mum’s being orphaned young. But not the ones about Alfred. It’s a curious business, this relationship between poetic and personal/documentary/historic truth. In fact, I think it’s a perilous business. But it’s the only one that matters. I’ve been brought up short by ‘history’ finding me out. I’ve been writing poems about people who are long dead, and can’t argue. I feel morally conflicted about them. But what about the living, and writing poems about them? What then? I’m going to have a think about that, and in a month or so, if I have the glimmerings of an answer, I’ll let you know. In the meantime, my thanks to the poets who gave me the courage to write about the living and the dead instead of describing mountains: Kim Moore, Gordon Hodgeon, Norman MacCaig, and, lately, Fiona Benson and Pascal Petit. Those five especially. And thanks and ever thanks to Kevin Morley, who played the part of the honour guard sergeant with such conviction, to Tony Dunlop, Kevin McQuinn. Thanks to Rev. Deborah Wainwright of Central Methodist Church for her quiet words at the graveside, and to all the volunteers of Project Bugle who arranged yesterday’s ceremony, and who continue to clean the graves and commemorate the deaths of men who died 100 years ago. When people ask ‘Why do you write?’ if the answer isn’t ‘Because I’ve got things to say and this is the way I do it…rather than music or painting or sculpture or essays or journalism or graffiti’ then something’s not quite right. If you’re having to make yourself write, then what’s all that about? I think that’s what Keats was getting at with this business of poetry needing come as birds to the tree. Poetry. Not poems or a poem, note. That’s usually going to be difficult, because words don’t just line up and snap to attention. We’re going to draft and redraft and get second opinions, and polish and refine, and we’ll never quite get it right, because if we did, there’d be no point in carrying on. We need to say what’s on our minds. We have to have something to write about, if you like. Ideally we need to be full as an egg and brimming and bursting with things to say. Hence the metaphorical reservoir. 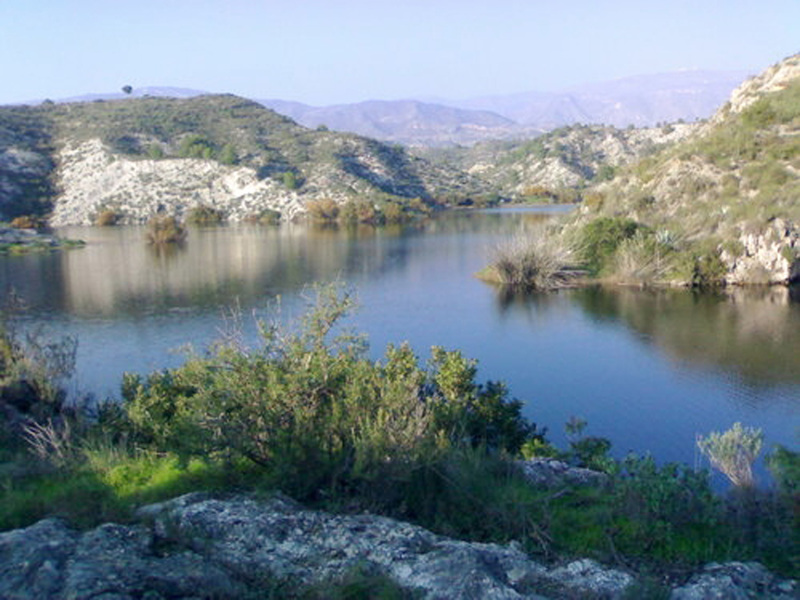 That was the pantano of Relleu; that is how it was meant to be. This is how it is now. Silted up, dried out. I used to tell students that if someone needs to use metaphor then there’s something wrong with the argument; bear with me, regardless. People ask: why write? Less often, I think, they might say: Why stop? I don’t think I’m talking about writer’s block. I’m not sure I understand that, since I think that’s about forcing yourself, for whatever reason, to write, rather than stopping. Why can you dry up? Well, maybe you find something else to do with your time, or other things take it over. Or you’ve said as much as you can or want about this and that, and there’s no point in going over the same old ground. Or you lose confidence. You look at what you’ve written, and you look at what other people have written, and suddenly you can’t see why anyone would want or need to read your stuff. An analogy for me would be my realisation that some hill routes were beyond me and my rickety legs, and that if I couldn’t do them I wouldn’t be settling for less, because all the time I’d thinking of where I wasn’t and not enjoying where I was. Something like that. I’ve been wondering how I can introduce this week’s guest, Martin Reed, and it turns out that the answer is : Obliquely. So let me go at it head on. A brief biographical note: Martin Reed was brought up in Somerset and now lives in Worcestershire. He worked for several years as an English lecturer and later became a partner in a communication and media company, writing scripts and directing video on a wide range of subjects from Thomas Hardy to becoming a foster-parent. He has had work published in many magazines (Agenda, Anon, London Magazine, Magma, Prole, The Spectator, Encounter, Envoi, The Interpreter’s House, Stand, Owl, Frogmore Papers, Other Poetry, Iota, Poetry Wales, The World and I, Poetry Review etc.) He has read his poetry on Radio 3 . In 1988, Reed won the National Poetry Competition. It was a watershed in many ways, followed by a hiatus. However, in the seventies he had the good fortune to meet the late Vernon Scannell, who became a close friend (Reed is now Scannell’s literary executor). Vernon Scannell recommended Reed’s work to Helena Nelson of HappenStance. She, like Scannell, liked his instinct for form and his love of melodic line and phrase. The publication of The Two-Coat Man in 2008 proved another turning point. And, says the HappenStance blurb, he continues to write poems. Just think about that,. Especially that sentence: He….won the national Poetry Prize in 1988. Nearly 30 years ago. And then that list of magazines and journals. And the insouciant ‘etc’. What could be left? Jaw-dropping, especially for someone like me who’s been published in very few places, and never read my stuff on Radio 3, and never been a literary executor. But for some reason he had a hiatus; he sort of dropped out of the poetry world, or lost confidence, or didn’t have the time, or……except that he didn’t give up, but went on looking for new kickstarts. Which is how I came to share a flat with him on a writing residential, and how I came to watch him working every night in an avalanche of typescript, and how we shared our interest in rugby, and music, and how we both ended up singing songs with last week’s guest Jane Clarke. (who, I think, is either tolerant or tone-deaf, because she’s the only person I’ve ever met who asked me to sing a second song). The upshot of all this is that I asked him to share some of his poems, and also my delight that sometimes it may feel as though we’ve dried up, but that it’s not permanent. I like this first one because of the way it reminds me how a revisited place can present you with two versions of yourself in an unnerving way. How suddenly the passage of time is a physical fact. our immortal heads those years ago. a measured discipline of mellow strings. Staying in one place can scare you to death all right. persistent ghosts in their long dark coats. for a sky as grey as the suds on our draining-board. Rash-red arms pulled a sodden corpse from the tub. from the wringer that mangled my mother’s thumb. in clothes-peg hedges, grazing lino fields. brought her home to the life she didn’t want. Our steamy neighbours whispered at the door. about death as the farmer surveyed his static herd. The line break is exact and exactly right. People gas themselves in kitchens exactly like ours. It’s a plain artful poem, and I love it. And because I met Martin at a writing residential, it reminds me that we all know where we get our ideas from…..from where we are and where we’ve been and who we met. And that includes books and films and music…all those amazing representations of reality that we endlessly improvise on (to borrow a notion from Harold Rosen). And how do we find out what our ideas are when we think we’ve dried up, and where may we find an art and a craft to shape them? Invariably for me the answer is at workshops. Doesn’t work for everyone, but I need other people to get me moving and tell me it’s all right. No prohibitions, but regular miracles. I had the impression that it worked for Martin, too. I hope so. I want to read more Martin Reed poems. Martin mailed this morning to tell me he’s just had two poems accepted by Envoi ….and that ‘hiatus’ means publishers and magazines and journals kept turning him down, and that he’s never stopped ‘scribbling’. There we are, Record set straight. This is increasingly important, as nexr week’s post will explain. Next week will be a 100 year anniversary and we’ll be looking at the relationship between factual truth and poetry. It could be complicated.